This delicious GF Italian Biscotti Recipe was carefully converted from a traditional Italian Biscotti made with wheat flour! After all why shouldn’t those with an intolerance for wheat be able to enjoy these delightful Italian cookies. 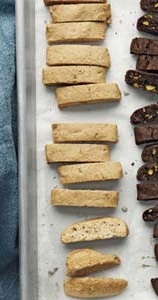 The most distinguishing feature of these biscotti is the anise* flavor. If you don’t care for anise, then substitute another extract flavor that you like. I’m sure you will thrilled with the results. This recipe is not quite as simple as the original because it is gluten free, which requires different flours and additional ingredients to obtain a similar texture and flavor. Other than that it is basically a simple recipe that does not require the use of a mixer, and is just delicious. I found that oil has an advantage over butter or margarine, the biscotti’s are not as crumbly. If you like softer biscotti, I baked it at 350 degrees for 20 minutes, then cut and rebake them for 4 minutes on each side. In the culinary arts, anise (pronounced "AH-niss") refers usually to the seeds of a plant with aromatic leaves and stems that taste like liquorices, fennel or tarragon. While the leaves of the anise plant can be used as an herb, it's mainly the seeds that are used in cooking. Sometimes called aniseed, the seeds are used as a spice, either ground or whole. 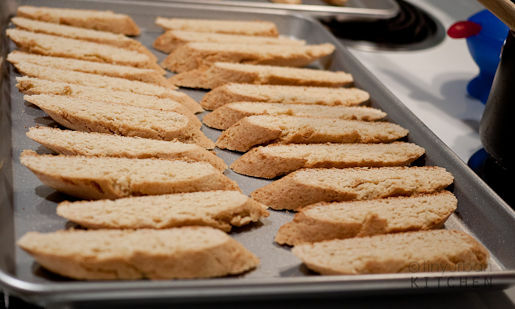 Aniseed is used in a various baked goods and desserts, and in many Biscotti like this Italian Biscotti recipe. Anise seeds are also frequently used in making Italian sausage. Anise seeds are also the basis for a number of alcoholic beverages, including Absinthe, Anisette, Ouzo and Sambuca. But maybe like me, you did not now that anise was used for Medicinal purposes. If this is something you are interested in you can find out more , by Clicking Here. But don’t forget to return when you are done. Place one oven rack in the center of oven and preheat oven to 350 degrees F (190 degrees C). Divide dough into two equal pieces. Form each piece into a roll almost as long as your cookie sheet. Place roll onto the prepared cookie sheet, and press down to 1/2 inch thickness. I am always looking for way to improve the end result when I cook or bake. One thing I have learned is GIGO, garbage in garbage out. When you back, use the best ingredinents you can afford. One of the best sources I have found for oil and extract is OliveNation.com They sell in bottles larger that what you find in the grocery store and savings are great.